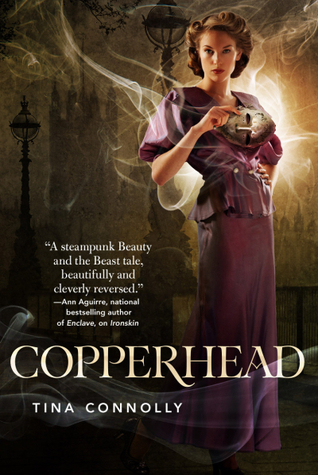 Copperhead complements and even exceeds the boldness of its prequel. Ironskin (where do these suggestive names come from?) took Jane Eyre as the model for its romance and family elements and then threw over that a thick layer of magic, faerie, and alternate timeline intrigue. This first time Jane had to come to terms with her stubborn and fairly insular nature. Now the onus is on her sister Helen, the social butterfly, to prove she has a backbone and can be stubborn too. You see then how the two books come at their problems from different angles? Jane begins stubborn and must learn to accept help from people whereas Helen, already hedged in by such a great number of people, must learn to depend on herself and be a heroine. It’s difficult to pick a favorite. The clear advantage here is that all the action takes place in the city. Before we were mostly holed up in a mansion on the edge of a forest, so while it was scenic and packed with nature imagery, it did feel as if we were missing out on much of the social scene and scandalous gossip. This time around we have a clear winner in the character known as Eglantine Frye. She’s an actress who lives a ragamuffin lifestyle with uproarious parties and a house that never fully empties. Much of this novel reminds me fondly of another steampunkish (emphasis on the punk) urban fantasy, one of my favorites, Soulless. Frye stands in for a more fashionably hip, Ivy Hisselpenny, and much of the cast of characters, especially the women, boast ridiculous names such as Agatha Flintwhistle, Louisa Mayhew, and Lady Dalrymple fairly in sync with Carriger’s imagination. What distinguishes this book even more favorably from an already excellent crowd is the strong characterizations and light symbolism. The way that the name copperhead doubles effectively as a reference to a hydra which grows back more heads than are cut off and just as much the continual masked nature of all the women in this city inspires one to sit back and connect the dots every now and again. Not many urban fantasy books can lay claim to such suggestive construction. Might we very well see this taught in high school classrooms alongside something by Margaret Atwood? Such future syllabi would not be doing either author a disservice. I see a lot of potential and – just as much, if not more – real accomplishments, effected in this series. But where can it go from here? Underground? Ooo, please say underground.